Japanese Movie DP 02: "Giratina and the Sky Bouquet, Shami"
American Movie 11: "Giratina and the Sky Warrior"
Shami, a small hedgehog pokemon, is getting a drink of water when it finds itself caught up in a battle between the legendary pokemon Dialga and Giratina! Giratina drags both Dialga and Shami into an alternate universe known as the Reverse World, but Shami is able to escape by using a technique known as Seed Flare. 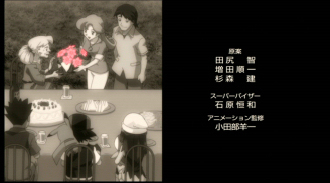 Later, the green pokemon comes into contact with Satoshi and his friends and, through the power of telepathy, tells them that it wants to go to a flower garden known as Gracidea. Our heroes learn that, every so often, a group of Shami gather together at the flower garden and fly off together in order to spread flowers throughout the land. 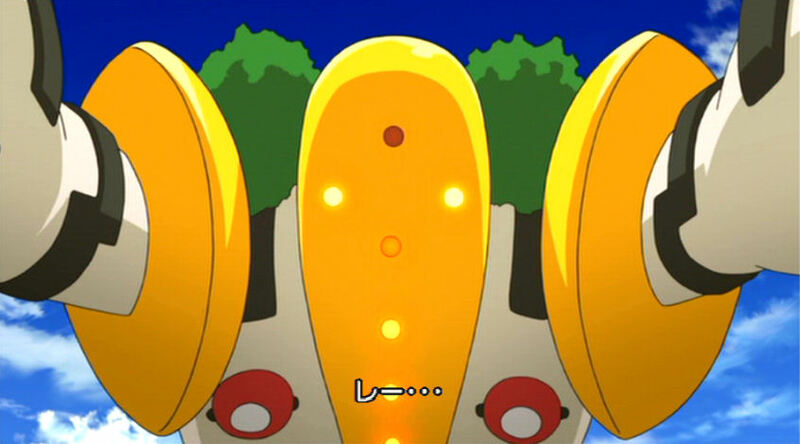 As Satoshi-tachi make their way toward the garden, they are dragged into the Reverse World by Giratina. There, they meet a scientist named Dr. Mugen Graceland. The professor has been studying the Reverse World for five years and tells them what he saw when Shami went there the first time. He leads them to an exit, warning them that they'd better get Shami to the flower garden as soon as possible. As our heroes resume their journey to Gracidea, they meet a villain named Zero who wants to capture Shami for himself. After escaping his attacks, our heroes find themselves sucked into the Reverse World a second time. Zero follows them and, by following his carefully thought-out plan, tricks Shami into opening another portal in the Reverse World with its Seed Flare technique. 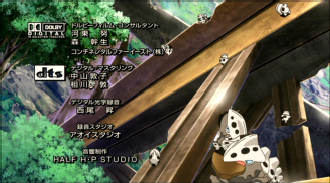 Giratina escapes into the real world but is quickly captured by a device on Zero's flying airship. Zero uses his machines to copy Giratina's powers, enabling him to enter and exit the Reverse World as he pleases. As Zero wreaks havoc on Giratina's world, Satoshi, Shami, and Giratina follow him for one last showdown. 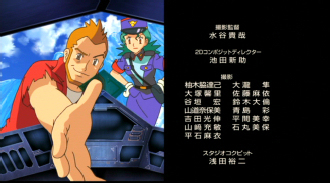 Our heroes eventually overpower Zero and send his ship flying, erasing all the data it had acquired from Giratina. Now that Zero is more or less taken care of, Shami can finally join its friends in Gracidea. I have to say...I really liked this movie a lot better than the last one. This movie may not be my favorite of all the Pocket Monsters movies, but it's pretty high up there. Aside from the absolutely gorgeous artwork (especially in the Reverse World) and another amazing soundtrack, we get a "cute" legendary pokemon who actually doesn't annoy the crap out of me. I mean...being cute is fine and all, but after a string of OMG KAWAII!!!11!!1!1!! legendaries who do little more than act "cute," it's refreshing to see one that's actually a bit of a jerk. Some of the little back and forths it had with Satoshi were genuinely funny and definitely secured a high spot for Shami in my personal list of favorite pokemon. This movie also had a really interesting villain in Zero. I love that we got some background information and motives for why he's so effin' crazy (unlike, say, the insanely generic Phantom) though I do question why anyone would walk around dressed like the pokemon he's trying to capture. He and Harley must have the same tailor or something. I also like how the movie flowed well from scene to scene in a logical fashion. Nothing really seemed out of place here (hello random hot springs scene in the Lucario movie! ), and it really didn't feel like we wasted too much time just dicking around for no reason. Yeah, we get the random "pokemon flying around while everyone's on the ferry" thing, but that was barely long enough to be all that annoying. That's not to say that I didn't have any problems with the movie. One major issue I had with it was the scene where Giratina is being captured by Zero's airship. Because, for some unknown reason, Zero just hops off his flying machine thingee and then leaves it behind, enabling Mugen and Satoshi to steal it and then ride around on it for the rest of the movie. If he hadn't hopped off, our heroes would have had no way of going up to his airship to stop the scanning (I mean, what's Satoshi going to do, actually use Glion? ), no way of keeping up with Zero in the Reverse World and, ultimately, no way of foiling his plans. Another problem I had with this movie was trying to get a sense of time with this thing. When everyone first lands in Gracidea, it's dark. Then, the sun comes out, which makes me believe that they just arrived in Gracidea at dawn. Now, fast forward to the end of the movie, where we see the sun rise a second time. Defeating Zero and all that would have most likely only taken a few hours, so what did everyone do for the rest of the day and that night? Hang around Gracidea? Go to the nearby town, sleep, and then come back? Why didn't Shami just leave right away? What in the world would our heroes find to talk about with a crazy old scientist during the span of a day? The Japanese DVD for this movie includes closed captioning-like subtitles, which really made it a whole lot easier for me to check for any potential dialogue changes between it and the dub. I really hope Media Factory includes them for every future release since they really do make my job that much easier. Plus, they give us some rather amusing subtitles when it comes to describing sound effects; if I was deaf, I couldn't imagine reading a description like "the sound of data being erased" or "the sound of Seed Flare going off" and knowing what the hell anyone was talking about. There were a few things that bugged me about the dub, but overall I'd have to say that it was pretty well done. None of the voice actors stuck out as sounding bad to me (well...maybe the overweight woman on the train), and the stuff that we've come to expect from the movie dubs these days - an unaltered score, a better-than-usual script, being shown in its correct aspect ratio - only made things better. I especially liked Zero's voice and, while it doesn't quite reach the same levels of intensity that his Japanese voice actor does when he starts to snap at the end of the movie, he still does an admirable job. Dialga, Giratina, and Regigigas keep their Japanese voices. Back when Kids' WB! 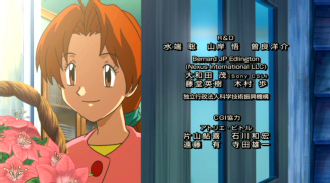 aired "Destiny Deoxys" back in 2005, they would trim a few seconds here and there from the non-dialogue portions in order to make the movie shorter. Y'know, to get more commercial breaks in and all that. Well, Cartoon Network pretty much does the exact same thing with this movie. And by doing this, CN managed to whittle away a good five minutes from the original version's runtime, turning and hour and thirty-two minute movie into an hour and twenty-seven minute movie. The previous two movies weren't time elasped - the Manaphy movie was an hour and forty-one minutes, while the Darkrai movie was an hour and twenty-five minutes - and didn't receive any significant cuts, either. So what gives, CN? Are the advertisement requirements in 2009 that much more demanding than they ones in 2007 and 2008? Is a two hour time slot no longer enough to air an hour and a half movie? CN also just flat-out sped up some scenes, something that's the most evident during everything before the movie's title sequence. One thing I'd like to bring up is the titular character's name - Shami. In Japanese, the character's name is written as シェ イミ ("Sheimi"). Now the official romanization Nintendo of Japan came up with is "Shaymin," which is the same thing that Nintendo of America ended up using. No biggee, right? My problem with that transliteration is...where did that n come from? The last part of its name seems to come from harinezumi ("hedgehog"), so why isn't it Shaymi instead of Shaymin? There is no n pronounced at the end of the character's name, so why even include it in the romanized version? It seems rather pointless. And because of that final n, the dub pronounces it (I mean...why wouldn't they? ), creating this weird, yet understandable, difference between the way the two versions pronounce the character's name. The English version also pronounces "Giratina" all funky. They try to force a connection between the gi and the r (producing something that sounds like the word gear) that doesn't exist in the Japanese version, giving us "Gear-ruh-tee-na." In the original version, it's simply "ghee-rah-tee-na." 4Kids did the same thing with Jirachi's name, too. I can see why a native English speaker would look at the words and come up with that pronunciation, but it'd be nice if the dubbers would take the time and actually listen to the way these names are pronounced instead of trying to apply English pronunciation rules to a Japanese name. Shami's two speech quirks (though I suppose "thought quirks" would be more accurate) got lost in translation. One of the things it does in the Japanese version is add a -shu to the end of all its sentences. So something like ikimasho ("Let's go!") would become ikimashu. I'm not quite sure what the reasoning could be behind such a quirk - and it seems to lose this quirk when it goes into its Sky Forme - but I think it adds something neat to the character that dub viewers don't get. The other thing it does has to do with the way it addresses itself. The Japanese language has a bunch of different ways to say the word I (as in the first-person pronoun) that changes depending on the person's gender, who he or she is talking to, how old he or she is, etc. Because of this, you can often tell someone's gender just by the pronoun they use. Shami (who's genderless in the games, by the way) doesn't give us these hints and instead refers to itself as mi (as in the last syllable of its name). Which, I suppose, could further be translated as "me." Having Shami refer to itself as mi is all well and good for the Japanese version, but if they had done that in the dub, it would have likely made the pokemon sound like a caveman or something ("Me want to go to Gracidea!"). So I can't really fault Pokémon USA on this one. 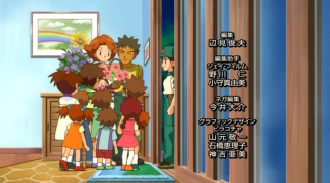 Later, when Team Rocket spots Shaymin for the first time, Jessie says that they'll give Shaymin to "the Boss." 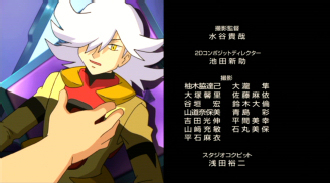 In the Japanese version, Musashi actually calls Sakaki by his name. This next thing was my biggest problem with the dub; Shaymin's Sky Forme voice. Ignoring the whole "cute little things are girls, brave adventurous types are boys" sexist BS for a moment, the reason the voice change doesn't make any sense to me is because Shami doesn't actually talk. It's using telepathy throughout the entire movie. So why, why, would it suddenly start thinking in a young boy's voice (or, as some have pointed out, Zoey's voice) because it changed form(e)s? Wouldn't it just do what the Japanese version does and just think in the same voice regardless of any transformation? The only time Shami actually *does* speak is at the beginning of the movie before we find out that it can use telepathy and later on whenever it says its name as it attacks. Everything else we hear are the character's thoughts. Jessie and James: "Welcome master! Sir!" Newton: "Only Giratina can move freely in and out of this world!" In both instances, the word being used to refer to Mugen is sensei, which can mean "teacher" or "doctor." "Master" makes it sound like Team Rocket and Zero worship him rather than simply respect him, which is kind of odd considering that neither party has any reason to do so. Newton: "But, obviously Zero never forgot them." In the Japanese version, Mugen says that Zero didn't give up after that, not that he didn't forget. The reason I'm pointing this out is because the dub makes it seem like Zero has some kind of photographic memory or something while with the Japanese version, one can infer that he simply used what he remembered and then worked to fill in the gaps necessary to complete the research. Later, the dub, unsurprisingly, dances around the whole issue of Giratina possibly dying while the Japanese version says it outright. I don't see why PUSA would shy away from saying the word "die" in the year 2009 - Cartoon Network has no problem with that word these days. Have PUSA just gotten so used to auto-censoring the subject of death that it's become sort of a second nature to them? The final note I have has to do with Regigigas' voice. There are reports going around that a lot of its "lines" were either cut out or shortened for the dub, but that just isn't the case. There is one instance where the dub mutes out the pokemon's voice (it's during the scene when it begins pushing up against the glacier), but every other instance of its cry is left intact. The big question is why Pokémon USA would choose to mute that one bit out anyway. But could any of us *really* come up with a plausible reason for such a nonsensical change? And, finally, we see the Rocket-Dan getting attacked by Regigigas. 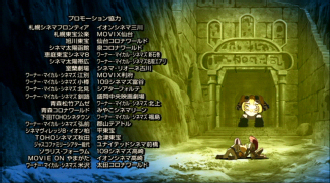 And even though Cartoon Network didn't play the ending theme to the movie, it does show up on the DVD. The song, called This is a Beautiful World, doesn't really do anything for me at all, but the songs this dub comes up rarely do. 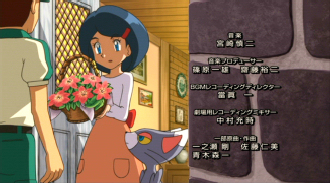 Originally, the ending theme was One by Crystal Kay, an artist who probably would have cost PUSA too much to use. Overall, I think this is a solid dub of a solid movie. While I'm not too keen about the whole Sky Forme voice change nonsense, that really wasn't enough to bring down the entire movie the way some of the changes done to the other movies have. I'm really glad the dub has gotten to the point where we don't have to worry about the movies being "ruined" like we did in the past, and I'm fairly confident when I say that the Arceus movie is going to be handled just as well as this one was.